I was thrilled when I got this book but for a less then ideal reason. Sure the book sounded good but I needed to read a book with "white" in the title for a challenge. How silly is that? Of course, I never would have said I'd review it if I didn't think I'd like it. Still the book sat on my shelf for months before moving to my read these soon pile. Where it sat for another month. Poor book! How long did it take to finish the book once I started reading? Same day. I love the cover but if I had read the first paragraph instead of the back cover, I never would have wanted to read it. Everything ties together nicely and I didn't feel rushed at the end. I grew to love the main characters and hope to see them in another book (White Lies is being written). I enjoyed rooting for the underdog, yelling at the bad guys, shaking my head at moments and wanting to hit people upside the head. The boss is a perfect example of promoting civil servants through politics instead of performance and I absolutely loved him being described as "a C-list person in an A-list position". Dr. Root and Mr. Smith are a couple of my favorite characters. When Arkansas experiences a wave of rare fatal diseases, the CDC sends disgraced doctor Dave Richards to investigate, and he knows this is the case that could save his career. When he teams up with FBI agent Paula Mushari, Richards thinks he may have found the person who can help him find the answers. But as they dig deeper, they begin to get a sinister glimpse into what they are dealing with-a vengeful sect, led by the son of a late white supremacist, intent on destroying a nation. As Richards fights to save his job, he and Mushari must race against the clock to prevent a plague of catastrophic proportions. 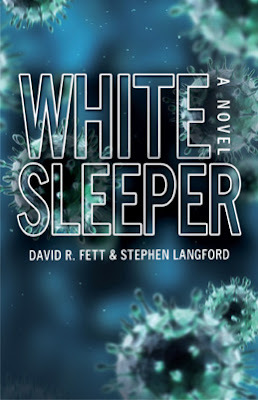 Visit White Sleeper for buy links and author information. Hey guys? Update the website! Disclaimer: I received a complimentary review copy of this book without any obligation to write a positive review. The opinions expressed in this post are mine and may differ from yours. Book information courtesy of back cover and publisher.